Defined contribution plan record keepers continued their focus on employee engagement and financial wellness in 2017, as assets rose nearly 15% during the year. 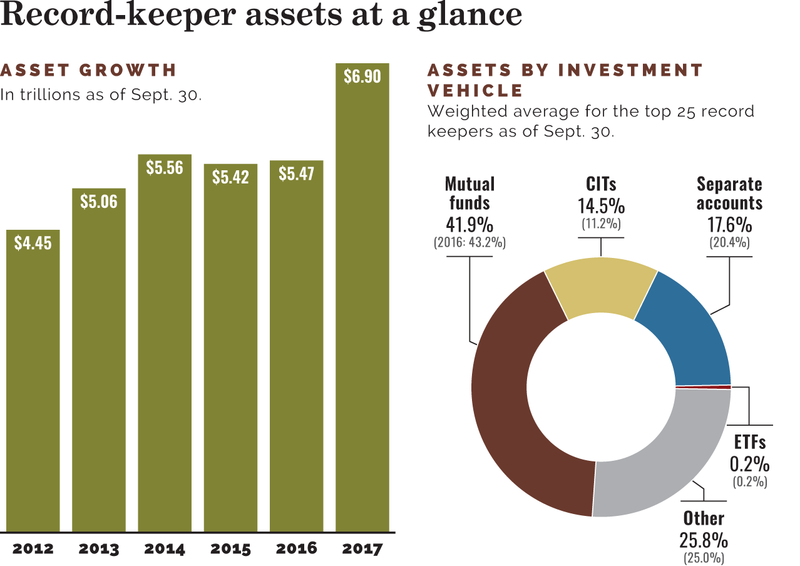 Record-keeper assets hit $6.9 trillion for the year ended Sept. 30, 2017, according to the latest Pensions & Investments survey of the largest record keepers. The total is a 26.2% increase from the $5.47 trillion reported the year before, and a 14.9% increase when omitting fifth-ranked Alight Solutions and ninth-ranked Transamerica Retirement Solutions, which did not participate in last year's survey. The number of participants among survey respondents increased 12.6% to 97.53 million from 86.63 million as of Sept. 30, 2016, including about 4.7 million participants each for Alight and Transamerica. Forty-three record keepers participated in this year's survey, the same as last year. In terms of rankings by assets, Fidelity Investments was again at the top for DC record keepers, with $1.877 trillion as of Sept. 30, up 16.9% from the previous year and more than three times the assets of the next record keeper. Fidelity also led in number of participants, with 20.854 million, up 5.8% from the previous year. That number was more than 12 million more than the second-highest record keeper. "I think a lot of what we're doing is making sure that the foundation of our business is solid," said Robert Salerno, senior vice president of relationship management at Fidelity Investments, Boston, in a telephone interview. "We've got a tremendous amount of scale, and we have a huge responsibility with the clients and participants we serve today." TIAA-CREF, New York, ranked second for the third year in a row with $607 billion in assets as of Sept. 30, up 32% from the previous year. The significant increase, much higher than the other top record keepers, was due in part to a change in reporting methodology by TIAA, and prior years' assets were not updated. Among record keepers' priorities in the past year, consultants agree, was a continuing focus on employee engagement. "I think that what we're seeing, there's still a focus on engagement, I think that will always be there," said Amy Reynolds, Richmond, Va.-based partner at Mercer, in a telephone interview. "There's increased utilization of mobile and the emergence of mobile as an engagement channel." Of the 43 record keepers surveyed, 38 use mobile applications for communication, the same as the previous year. "Now (plan sponsors) have an additional tool to tap into so they're looking for how their partners can help them in that regard," Ms. Reynolds said. Engagement means more than making sure participants receive and respond to communications, said Jeri Savage, Norwalk, Conn.-based partner, defined contribution research, at Rocaton Investment Advisors LLC, in a telephone interview. "That concept of engagement is not only the participants' participation in the plan but having a good investment structure and helping them make smart decisions once they're in the plan," Ms. Savage said. Making those smart decisions is a priority for DC plans and their record keepers, not only when it comes to investment decisions, but also for participants' overall financial wellness. "The biggest thing everyone's talking about is financial well-being or financial wellness," said Robyn Credico, Arlington, Va.-based defined contribution consulting leader at Willis Towers Watson PLC, in a telephone interview, "so all the record keepers are talking about providing solutions to support that. Clearly, evidently, no one has the same definition or consistent solutions. For some, it actually doesn't have much to do with the DC plan, it's just financial wellness overall, or maybe debt management or whatever." This results in an experience for participants that covers all the saving they have to do. Edmund F. Murphy III, president of Empower Retirement, Greenwood Village, Colo., said it "is sort of the convergence of retirement, health care, wealth management if you will, all coming together." "Increasingly among plan sponsors they're interested in providers that can offer a more holistic experience, one that transcends 401(k) that incorporates assets from other goal areas, perhaps outside assets, and has an advisory platform that can help participants achieve their goals whether it's retirement or other areas," Mr. Murphy said. Fidelity's Mr. Salerno said that participants want that overall solution. "We are focused on the total well-being of the individual and trying to do more to help them with multigoal planning," Mr. Salerno said. "It's not just retirement planning, and I think in a lot of cases our participants are looking for ... sort of that reality check that they're on the right path." "They're looking for full solutions," said Mr. Salerno, and "looking for help that's more broad than retirement planning. That could be investment-related solutions like target-date funds or managed accounts or it could be an ongoing relationship with someone who's trained in the industry that will keep them on the right track." Doug Chittenden, TIAA's executive vice president and president of institutional retirement, said in a telephone interview that one primary focus is the idea of retirement income. "Increasingly plan sponsors understand that these assets translate into income that replaces participants' paychecks when they retire, " Mr. Chittenden said. One feature TIAA is rolling out, he said, is a Retirement Income Test Drive, in which a retiree can select a lifetime income payment at retirement for two years. "We see how that works for them, if that meets their budget, and if it does, convert it into a lifetime income," Mr. Chittenden said. Vanguard Group, Malvern, Pa., ranked third in assets, up from fourth the previous year, with $511.8 billion in assets as of Sept. 30, up 17.1% from a year earlier. Lauren Valente, principal, head of retirement plan experience, said in a telephone interview that much of the priority of plan sponsors has been in the realms of value and advice, as well as the growth of professionally managed accounts, whether it's target-date funds or managed accounts. "We have over half of our roughly 4.6 million participants invested in a single (target retirement fund) as their retirement savings vehicle," Ms. Valente said. "We do anticipate nearly three-quarters of Vanguard participants in a professionally managed option by 2021." Empower Retirement ranked fourth, down from third in 2016, with $500 billion in assets as of Sept. 30, up 13% from the prior year. Alight Solutions, Lincolnshire, Ill., ranked fifth in assets, with $410.4 billion in assets. Predecessor firm Aon Hewitt reported $377.2 billion in assets as of Sept. 30, 2015, the last time it participated in the P&I survey. Alison Borland, senior vice president and head of defined contribution at Alight, said in a telephone interview that their conversations with clients and participants overwhelmingly show financial wellness as a priority. "It's really getting wherever that individual is in the spectrum of retirement security and moving them to a better spot," Ms. Borland said. One strategy Alight employs specifically for engagement is to capture participants' attention during annual events like open enrollment, when "someone's already thinking about benefits," Ms. Borland said. Another priority for record keepers and their plan sponsor clients is cybersecurity, as knowledge and concern about the issue becomes more widespread. This year was the second in which P&I asked record keepers how much they spent on cybersecurity technology in the survey period. Respondents said they spent a total of $222 million for the year, 158.1% more than the $86 million they said they spent in the previous year. That number is likely significantly higher in reality because Fidelity declined to provide a dollar amount. The number of cybersecurity professionals employed by record keepers also increased 62.5%, to 3,604 professionals as of Sept. 30, 2017, compared to 2,218 the previous year. Ms. Borland said plan sponsors' awareness of the need for cybersecurity is constantly increasing. "I'd say it's getting more pronounced every month," Ms. Borland said. "When we look at our business, we're somewhat unique in that we have millions of participants for which we're protecting health information" in addition to retirement information. "We've had to focus on, and be keenly aware of it, for a very long time. More clients are asking about it proactively than ever before." "When there was an event or an issue, that was when clients would ask about it (previously)," said Ms. Borland. "Now we're getting the proactive questions. The frequency of conversations as well as the depth of conversations" is increasing. Separately, mutual funds still dominate as the primary form of investment vehicle, although collective investment trusts continue to gain traction. Mutual funds accounted for 41.9% of assets record kept as of Sept. 30, down from 43.2% a year earlier, while separate accounts also dropped to 17.6% of assets as of Sept. 30 from 20.4% the previous year. Other forms of investment vehicles rose slightly to 25.8% of assets from 25%, while collective investment trusts rose to 14.5% from 11.2%. Among record keepers with the largest number of clients, Paychex Inc., Rochester, N.Y., remained the top-ranked record keeper, with 80,000 for the latest survey vs. 76,000 in the previous survey. ADP Retirement Services, Roseland, N.J., stayed in second place, reporting 74,672 clients vs. 64,829 in the previous survey, and Voya Financial, New York, remained in third place, with 48,211 clients vs. 46,946 in the previous survey. The rest of the top 10 record keepers saw their rankings change because of the inclusion of Alight Solutions and Transamerica. Alight's predecessor firm, Aon Hewitt, declined to participate in last year's survey because of the February 2017 announcement of the acquisition of the record-keeping business by Blackstone Group LP. The record-keeping business adopted the Alight Solutions name in June after the purchase closed. Transamerica declined to participate in the previous survey because of its acquisition of Mercer's record-keeping business in 2016, and current assets provided for the firm are as of Dec. 31, 2016. Voya Financial, Windsor, Conn., moved to sixth from fifth with $357.7 billion in assets as of Sept. 30, a gain of 15% from the previous year. Bank of America Merrill Lynch, Pennington, N.J., remained at seventh place with $248.9 billion, up 13.1%. Wells Fargo Institutional Retirement and Trust, Charlotte, N.C., fell to eighth place from sixth place in last year's survey. However, Wells Fargo's asset total was overstated in last year's survey at $227.8 billion and restated at $186.9 billion, which would have placed the company at eighth place. Compared to last year's revised total, Wells Fargo's assets increased 13.7%. Transamerica Retirement Solutions, Harrison, N.Y., was ranked ninth with $206.8 billion. Principal Financial Group Inc., Des Moines, Iowa, moved to 10th place from ninth, with $188.9 billion, up 15.2%.